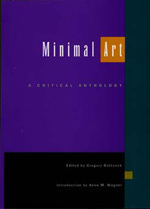 Here with a new introduction and updated bibliography, is the definitive collection of writings by and about the work of the 1960s minimalists, generously illustrated with photographs of paintings, sculpture, and performance. Gregory Battcock was a painter, lecturer in art history and criticism, and editor of The New Art: A Critical Anthology and The New American Cinema. He was a frequent contributor to Arts Magazine, Art and Literature, College Art Journal, and Film Culture. Anne M. Wagner is Professor of the History of Art, University of California, Berkeley.